With a refendum on another new constitution just weeks away, Egyptians are scouring the document to discover how their hard-won rights and freedoms will be protected. Rights campaigners say the new document does away with the Islamist-inspired "shortcomings" of its 2012 predecessor, which was faulted for entrenching Islamic oversight on lawmaking and falling short on basic freedoms. As it stands, the new draft -- passed to interim President Adly Mansour for approval last week after a 50-strong panel finalised the new draft -- would bolster press freedoms and hold Egypt to its obligations under international rights treaties, but may curtail labour movement rights. Observers say freedom of expression is well-framed in the amended document. Yet many fear its loose definition could lead to possible constraints in future legislation. "The provision is okay, but it is weakened by the fact that it fails to define limitations or how to balance potential conflicts with other articles," Heba Morayef, Egypt director for Human Rights Watch (HRW), told Ahram Online. "The art of establishing a right is to be very specific, and narrowly define restrictions it is subject to," according to Morayef. Relying on laws for fundamental rights unsettles many activists, given Egypt's history of unrepresentative parliaments dominated by ruling parties over decades of authoritarian rule. Morayef singled out a new article under which the "state is bound by international human rights treaties Egypt has ratified," and which she says constitutes "much stronger rights protection." "It has an additional tool: you can now draw on international definitions of [fundamental rights and violations] and refer to torture under international law [for example]," she said. "That's real progress to me." Another change for the better, the rights advocate says, is jettisoning Islamist-drafted Article 81, which stated that the practice of rights and freedoms should not "conflict with" the state and society provisions of the charter – a provision faulted for being overly broad and open to abuse by authorities. Rounding off the document -- which would replace the one signed into law by Morsi last year after a referendum -- coincides with fresh political tumult in the wake of a newly-passed law on protests, which rights groups slam for sharply curtailing the right to protest. The charter guarantees freedom of peaceful assembly and demonstration, but says the right will be prescribed by the disputed legislation, to the dismay of many. In recent days, police have violently broken up protests in the capital and elsewhere by both Islamists supporting ousted president Mohamed Morsi and non-Islamist demonstrators. Several activists, some of whom helped to ignite the 2011 uprising that unseated autocratic president Hosni Mubarak, have been arrested. The draft charter enshrines an outright ban on closing down, proscribing or censoring papers and media outlets, in a more "tightly" phrased provision than that of the old document. "This means newspapers or institutions cannot entirely be shut down," says lawyer Adel Ramadan, of local NGO the Egyptian Initiative for Personal Rights. This raises the possibilty that some Islamist-run channels shut down after Morsi's ouster could return to the airwaves. In case of violations, a criminal rather than an administrative court order may pull a certain programme off air or ban an individual, he argued, citing extremist discourse adopted by a number of Islamist stations during the Morsi era. Media may be censored, within limits, at times of war and public mobilisation, according to the new charter. In another break with the past, the constitution has in effect scrapped prison sentences for press and expression-related crimes -- penalties enforced under Morsi, as well as during Mubarak's 30-year rule. "A journalist now would never risk jail for criticising a president or his prime minister, as was the case under the old order," said Mohamed Abul-Ghar, who sat on the 2013 drafting committee. Some analysts, nevertheless, remain sceptical about exceptions itemised in this regard, which include: inciting violence, discrimination between citizens or slander/libel. "I would personally rather see no exceptions made at all," Journalists Syndicate member Khaled El-Belshy said. "Financial fines, hefty ones if necessary, or other professional penalties, up to a ban from the profession, could have sufficed." El-Belshy was all for broadening the syndicate's mandate to hold violators accountable, and stressed that clear-cut definitions, namely on "incitement of violence," should be provided. He also noted that considerable strides pertaining to press freedoms have been made, saying that almost 90 percent of proposals floated by journalists and the syndicate were incorporated in the new draft charter. While the law states newspapers can be established by "notifying" authorities, it leaves the matter to regulation by law in cases of TV/radio broadcasters and online papers - possibly paving the way for undue restrictions on such media. Artists, writers and filmmakers are no longer vulnerable to lawsuits brought by individuals irked by their artwork. Only state prosecutors would be entitled to to bring cases against their works. Analysts agree that rights for the disabled, as well as the regulation of arbitrary detention, are well set out. But many take issue with a provision limiting the right to practice "religious rituals" to Abrahamic religions -- Islam, Christianity and Judaism -- a concept that campaigners worry will infringe on rights of some Egyptian religious minorities such as Bahais. Observers have hailed the treatment of children's rights, saying the new charter provides better protection against violence, and embraces "specific language" on child labour, according to HRW's Morayef. While similar guaranteed protections were patchily applied before, a new caveat criminalising torture, with no statute of limitations, has been added. However, activists who advocate on behalf of Egyptian workers -- whose mobilisation grew in recent years, comprising a major part of the country's burgeoning protest movement -- have criticised the new draft. Many have expressed alarm over the potential for future labour action under the provisions of the draft charter. Labour activists praised the press and media safeguards contained in the new document, which they said would allow them to air their grievances, but argued that their freedoms are still in jeopardy. As the charter stands, to strike is a "right regulated by law" -- a negative holdover from the 2012 constitution and a major source of indignation among activists who describe it as "arbitrary." The current labour law requires prior notification of strikes and two-thirds consent from respective state syndicates. "Even if they come up with a new law, it will merely serve business owners," Fatma Ramadan, board member of the Egyptian Federation of Independent Trade Union, told Ahram Online. "They (the authorities) continue to take their cue from the old regime." 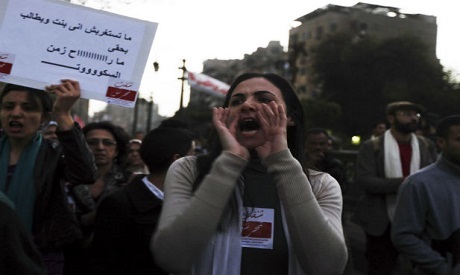 Upwards of 3,400 protests over economic and social issues were held in 2012 -- mostly labour actions -- according to the Egyptian Centre for Economic and Social Rights. "Out of the thousands of stoppages and strikes over the past years, the number of those that complied with legal regulations could be counted on one hand," Ramadan said. "They are attempting to stifle the revolution that brought them to power," she added. Ramadan believes that the charter also short-changes workers on organisational freedoms, making them worse off than they were in the 2012 document. Critics say an article that fails to clearly provide for the right to establish independent trade unions and leaves the issue up to lawmakers invites further restrictions in favour of cynical state bodies. While the 2012 document enshrines "freedom of establishing unions and cooperatives," the new text does not contain the word "freedom," something Ramadan says impairs this right in favour of the state-sponsored federation the Egyptian Trade Union Federation (ETUF), which has had a stranglehold on labour organisation for more than 50 years. "No state union is concerned with worker's grievances," Ramadan said. "We have attained our rights and made gains only through our labour movement," she added. It allows political parties to be formed on the basis of atheistic ideologies....but not on the basis odf Islam. This alone is sufficent for rejecting it outright. What is your logic on this ? Throughout the world constitutions and laws prohibits the formation of political parties based on religions because of the clear and proven problems it can bring. Politics and religion dont mix wherever your are and no matter if your country is Muslim, Christian or whatever. However it does not take away your right of practising whatever religion you want to practice. Where did you even read the word atheism in this constitution ? You are simply bringing up a false debate here that is going in a clear direction that anyone whit half a brain would understand. Your are simply implying here that this constitution is promoting atheism while killing or prohibiting Islam. This in a nutshell is your logic which is strangely resembling what the Muslim extremists like the Salafist and the Muslim brotherhood have been accusing anyone saying a word against them of.